It's May 25th and I'm back in New York. We had a great end to the school year at the U of Manitoba in April. There were a lot of great recitals and ensemble performances to end the semester, and I was especially proud of our students this year! It's been a busy few weeks since I've been back in New York. On May 5th my quartet w/Bryn Roberts, Matt Clohesy and Quincy Davis played at The Kitano. A few days later I drove to Atlanta to pick up my son Liam from Emory, he had a great first year there. 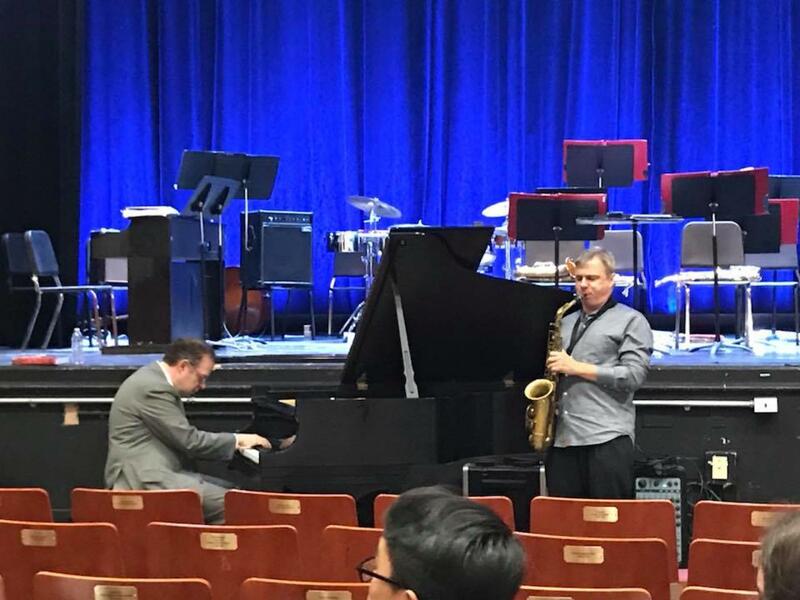 On the 14th Bill Charlap and I played a duo concert and did a Masterclass at Fort Hamilton High School in my neighborhood of Bay Ridge. It was put together by an old friend and fellow P.A. High school grad Tom Oberle who runs the Arts program there. And it was done in an auditorium dedicated to my first musical mentor and junior high school band director, Larry Laurenzano. He even hired Tom to replace him when he left. Funny how life seems to be full of those odd coincedences. That same week I played a wedding for a jazz fan who heard me on the live stream of WBGO while working in China and found me online. Freddie Bryant played guitar and Matt Clohesy played bass, both great players! In the past week I did two rehearsals and a night at the Kitano with an old friend from Staten Island, Mike Morreale, a great trumpet player. Later this summer, July 16th, my quartet will be back at Dizzy's. Then July 25th I'll be playing will Bill Charlap at the 92nd St Y, in tribute to Leonard Bernstein, as part of their Jazz in July Festival. In August I'll be doing our school's Jazz Camp. In the meanwhile I'm thankful for the time with my sons! My youngest turned 17 earlier this week, amazing how time flies! Thanks for checking in, hope to see you at a club soon!